My all-time favorite drink at Starbucks is Toffee Nut Latte, and I find that it’s such a bummer that it’s only available during the Christmas season. The rest of the year, I always order a cup of caramel machiatto and ask for hazelnut syrup instead of the usual vanilla. I learned it from a nice barrista who shared the tip with me several years ago. It almost tastes like Toffee Nut Latte, and I love it. Either way, I am still one of those who perk up when I know that the Red Cup Season is near. Yesterday officially started the season, so I rushed out to finally have my favorite fix. 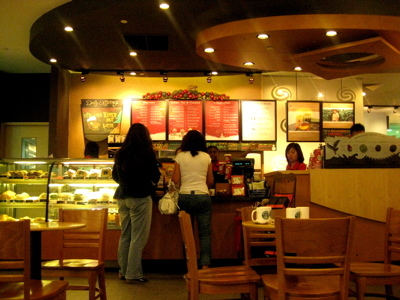 Seeing the red menu board and the barristas in their red polo shirts was as much of a treat than having coffee itself. Unfortunately, Singapore doesn’t have the Starbucks Planner gimmick like in Manila, so I guess I’ll have to break my yearly tradition of collecting stickers to get one or two (I collected three back in 2006!) planners. But I’m not too concerned about it, because from the photos Venice shared in her blog, it’s not as inviting as I hoped. I’ll probably just get another Moleskine planner for 2009. I’ve had quite a lot of free time lately. Free time to rest. Free time to wander around the city. Free time to make some art. And free time to be able to sit down and read. For One More Day by Mitch Albom: Read. Spot of Bother by Mark Haddon: Read. 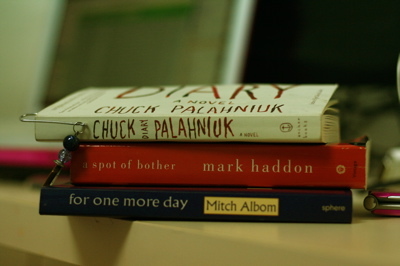 Diary by Chuck Palahniuk: Currently reading. The cold weather in Manila these past few days has been perfect for snuggling in bed with a good book. If only I had any to read. I’ve been meaning to go shopping for books, but every time I’m at the bookstore, I seem to be left stuck with choosing a good one (or two) to buy. 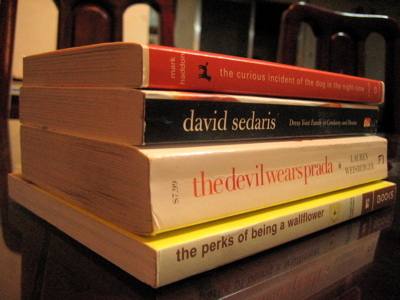 The yearly Manila International Book Fair is something that no bookworm would dare to miss. I had been talking quite a lot about it, even a few weeks prior to the actual event, but I figured I’d let it pass this year since I was flat broke. My bank account has just seen too much shopping in the last few months.